BRIDGEPORT, Conn. – In keeping with Connecticut’s Beardsley Zoo tradition, hand-reared baby animal names are chosen by their professional care staff, recognizing the depth of the round-the-clock, seven-day-a-week commitment required for newborn care. 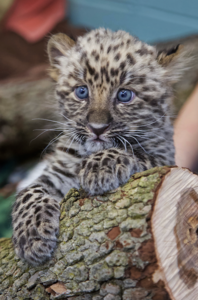 The Animal Care Specialists for the Amur leopards (Panthera pardus orientalis)have chosen names from the stars for the center of their worlds for the past ten weeks. Kallisto is another well-known constellation, more frequently referred to as Ursa Major. In Greek mythology, Kallisto was a nymph, a divine spirit who maintains nature for the environments where they make their homes. The origin of the name in Greek means “most beautiful,” a tribute to the female Amur cub’s striking appearance due to her melanistic coat color, an extremely rare black color variant. Both Orion and Kallisto can be seen on one of the Zoo’s two new webcams, offering live streaming video into the Amur leopard cubs nursery (as well as the Natt Family Red Panda Habitat) every day from 8:30 a.m.to 6:00 p.m. While the leopard cubs are still growing and being fed by animal care staff, the web cam offers a way to watch them play, climb, sleep and tussle. The Red pandas’ webcam is trained on their outdoor habitat. Both webcams can be accessed through the Zoo’s website: www.beardsleyzoo.org. A rare subspecies of leopard that has adapted to life in the temperate forests from Northeast China to the Korean peninsula and the Russian Far East, Amur leopards are often illegally hunted for their beautiful spotted fur. The Amur leopard is agile and fast, running at speeds up to 37 miles per hour. Males reach weights of 110 pounds and females up to 90 pounds. They prey on sika, roe deer, and hare, but the Amur leopard has to compete with humans for these animals. They live for 10-15 years in the wild, and up to 20 years in human care. In the wild, Amur leopards make their home in the Amur-Heilong, a region that contains one of the most biologically diverse temperate forests in the world, vast steppe grasslands, and the unbroken taiga biome. Let your curiosity run wild! Connecticut's only zoo, celebrating its 97thanniversary this year, features 300 animals representing primarily North and South American species. Guests won't want to miss our Amur (Siberian) tigers and leopards, Brazilian ocelot, Mexican and red wolves, and Golden Lion tamarin. Other highlights include the Natt Family Red Panda Habitat, our South American rainforest with free-flight aviary, the prairie dog exhibit with "pop-up" viewing areas, plus the Pampas Plains featuring maned wolves, Chacoan peccaries and Giant anteaters. Guests can grab a bite at the Peacock Café, eat in the Picnic Grove, and enjoy a ride on our colorful, indoor carousel. For more information, visit beardsleyzoo.org.